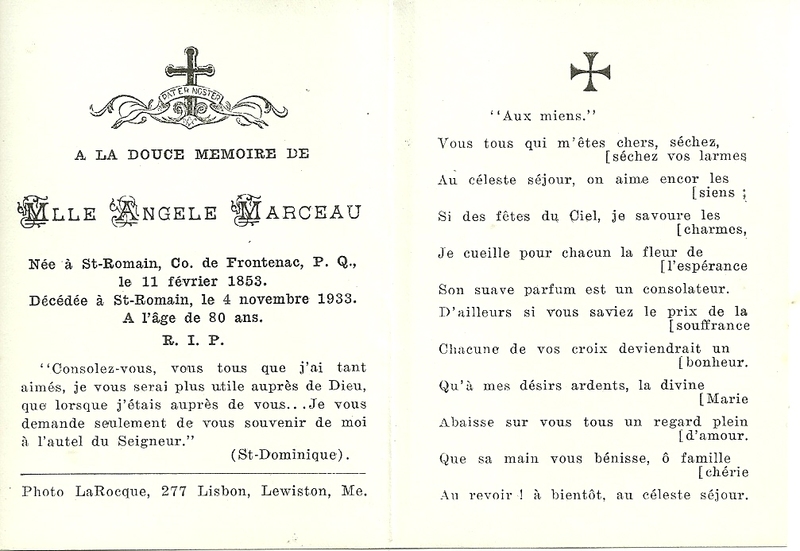 Card for the funeral of Mlle. Angele Marceau, who died 4 November 1933 at the age of 80. There's a photo credit for LaRocque, 277 Lisbon Street, Lewiston, Maine. Mlle. 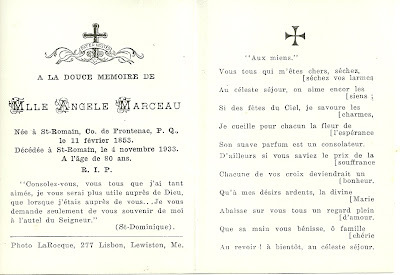 Marie Angele Marceau was born 11 February 1853, the daughter of Paul and Angele (Couture) Marceau in Frontenac County, Quebec, possibly near Lambton. Angele (Couture) Marceau was born in the Gaspe region of Quebec. The paternal grandparents of Mlle. Marie Angele Marceau were Augustin and Catherine (Fradet) Marceau. Her maternal grandparents were Olivier and Veronique (Joncas) Couture. 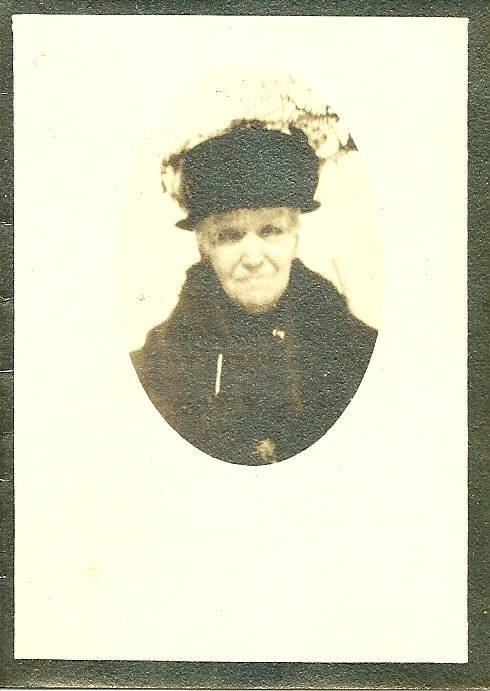 She had a sister, Marie Sara Marceau, born 19 December 1854 in Lambton, Frontenac County, Quebec. I believe she is the Marie Sara Marceau who married Louis Beliveau in 1874. Really thought I was going to make a connection with this one as I have Marceau, Couture and Fradet ancestors from Quebec, but sadly no connection that I can see. Many thanks for sharing though. Oh, what are the chances! Maybe someone else will happen by and make some connections. BTW, have you read Champlain's Dream by David Hackett Fisher? Lots of names in there, especially from the Charente-Maritime dept of France, as that was the home of many of the early settlers to Acadia and Quebec. No, I haven't read it. I'll have to see if I can get hold of a copy. I haven't really researched my French Canadian ancestry much as my cousin had already done most of it before I started, but would like to study up on them a little more to 'flesh out the bones', so to speak.